A man making an invocation with raised spear as he sacrifices an ox for the spirit of a girl killed by lightning next to her shrine. This seems to be the occasion witnessed by Evans-Pritchard in 1936 when relatives gathered to make sacrifice at a colwic shrine for a girl called Nyakewa. 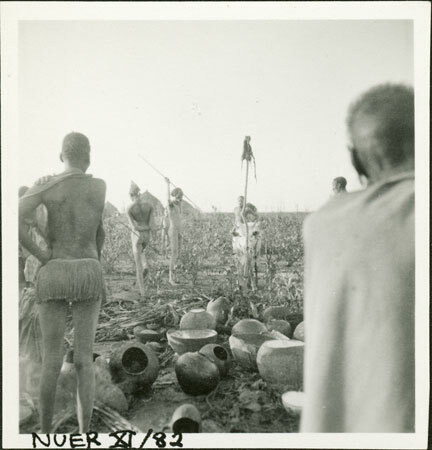 The shrine is visible in the foreground just beyond the beer vessels, consisting of a low earth mound with a shrine-stake (riek) planted in it and part of a sacrifice placed on top. Nyakewa was considered to have become a colwic, a spirit taken directly by God. This specific intervention by the divine was considered so dangerous to all associated with the deceased that sacrifice is made by all relatives, and a special shrine erected with offerings. This sacrifice was by Nyakewa's senior maternal uncle, whose short invocation was witnessed by Evans-Pritchard on the morning following the main ceremony. His photographs of the main sacrifices the previous evening were affected by poor light. In all more than twenty animals were sacrificed over several days. Note on print reverse ms pencil - "02 2 colwic" & print front border ms ink - "NUER XI/82"
Morton, Chris. "Nuer colwic ceremony" Southern Sudan Project (in development). 03 Jan. 2006. Pitt Rivers Museum. <http://southernsudan.prm.ox.ac.uk/details/1998.355.537.2/>.